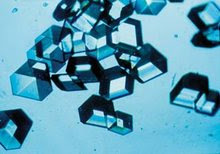 Those are insulin crystals. Cool, huh? Anyway, what I neglected to mention in my last post was when I got up this morning, and after taking my dexamethasone, my blood sugar reading was 17.5. It's normally between 6 and 8. I raised this with the folks while I was in for my chemo, and their best advice was to talk to my family doctor. I did. I'm now on sliding scale insulin. So I've got a pen and the whole kit and caboodle to inject myself as needed - 4 times a day: before each meal and before bedtime. This is just what I was doing in 2004 when I was taking dexamethasone with thalidamide. So this isn't new and it helps keep my blood sugar down while I'm taking dexamethasone. As Martha would say, "It's a good thing".